Reverse triggering is respiratory entrainment triggered by the ventilator especially seen among heavily sedated patients. We confirmed reverse triggering induced by auto-triggering in lightly sedated patient through an esophageal pressure monitoring. The reverse triggering frequently caused breath stacking with increased tidal volume. Physicians should be aware, even at an optimal level of sedation, that reverse triggering can develop, possibly caused by auto-triggering. Patient-ventilator asynchrony is common and associated with increased duration of mechanical ventilation, ICU length of stay and mortality [1, 2]. Reverse triggering is diaphragmatic muscle contraction induced by passive insufflation of the lungs, especially in deeply sedated patients [3, 4]. Through an esophageal pressure monitoring, we confirmed reverse triggering induced by auto-triggering in lightly sedated acute respiratory distress syndrome patient. Three days after an emergency operation for bowel perforation (day 0), a 67-year-old man (161 cm, 55 kg) was admitted to the ICU for respiratory failure. Chest radiography showed bilateral diffuse infiltration. 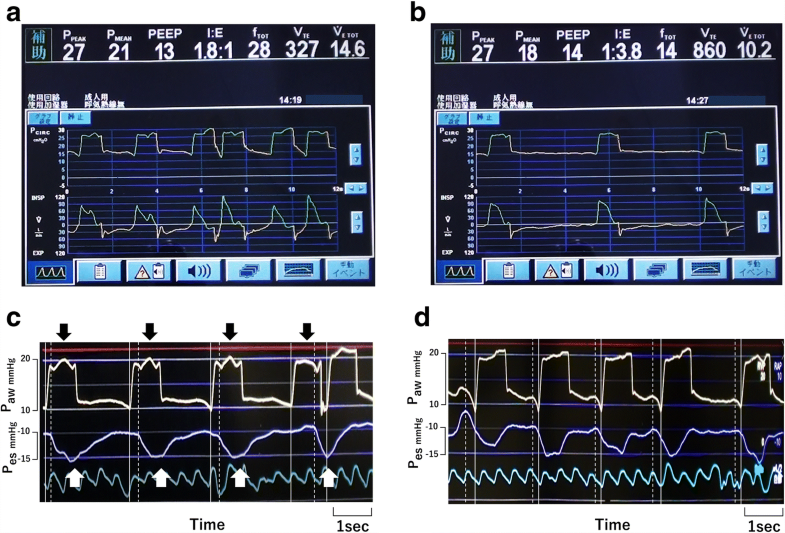 Owing to severe hypoxia (PaO2/FIO2 120 mmHg), mechanical ventilation in pressure assist-control mode was started along with continuous infusion of fentanyl. On day 4, pneumocystis pneumonia was diagnosed. On day 9, to redress oxygenation deficit, PEEP 14 cmH2O and FIO2 0.8 was required to keep SpO2 greater than 92%. On day 11, he scored − 1 on the Richmond agitation–sedation scale. Meanwhile, with the following ventilator settings: inspiratory pressure above PEEP 12 cmH2O, PEEP 14 cmH2O, inspiratory time 1.0 s, frequency 12 breaths/min and flow trigger sensitivity 3.0 L/min, ventilator graphics showed frequent double cycling interspersed with apparently normally triggered breaths (Fig. 1a). Esophageal pressure monitoring revealed repeated auto-triggering followed by reverse triggered breaths (Fig. 1c). We determined that air leak was causing auto-triggering, which we then effectively prevented by increasing endotracheal tube (ETT) cuff pressure (Fig. 1b). Thereafter, every machine cycle was preceded by neural effort of the patient (Fig. 1d). Auto-triggering is defined as a machine cycle delivered by the ventilator without triggering by the patient. It is observed in patients with air leak, excessive water in the circuit, high trigger sensitivity, or cardiac oscillations [2, 5]. In the case presented above, we confirmed that auto-triggering was the origin of reverse triggering through an esophageal pressure monitoring. We stress the importance of proper ETT cuff management by critical care providers to prevent potentially harmful complication, because auto-triggering can be solved completely once we remove air leak. Although clinical impact of reverse triggering remains unclear, it is an issue if reverse triggering produces double cycling (breath stacking) with increased tidal volume. Generally, to eliminate breath stacking, setting longer inspiratory time is considered . Even in the case of breath stacking beginning with auto-triggering, this strategy theoretically decrease the occurrence of breath stacking. However, once auto-triggering has been resolved, setting longer inspiratory time may cause significant delayed cycling and ultimately, dynamic hyperinflation of the lung. Physicians should be aware, even at an optimal level of sedation, that reverse triggering can develop, possibly caused by auto-triggering and lead to lung-injurious breath stacking. TI was a major contributor in the analysis of data and manuscript preparation. YU and NN equally managed the patient. JO undertook the critical revision of the manuscript. All authors read and approved the final version of the manuscript. Written informed consent for publication was obtained from the patient’s family.